Hideously deformed, hiding from the world's eyes in their dank holes, the Nosferatu thrive despite their ostracism from vampiric society. But what are they plotting in their dark caverns? What schemes are brewing in the nether regions of the night? 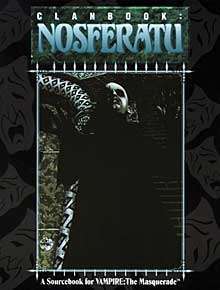 The Nosferatu watch everyone else, but who watches them? the horrfying details of the Nosferatu kingdoms under every city.